Stick with it and you will get results! Anyone?? I'm scared that it's like a rash and that I'm allergic. I'm not getting any major discomfort though so I hope it's not...! Epiduo for clearing clogged pores...? Hi! 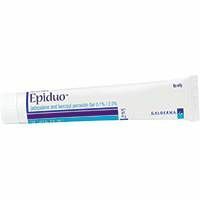 Anyone here using the combination of epiduo and tetralysal? (300 mg x 2 a day) my acne is hormonal, since quitting the bc I've gotten mild to moderate acne. my main problem is clogged pores! They are everywhere! And I squeeze them out everytime because I can't stand them on my face. I also have regular pimples and sometimes cysts. so far I've been on tetralysal for two weeks, I started epiduo a little over a week ago. i haven't seen any improvements yet. My face is worse if anything. Sure I know it takes time. But it's hard when it's so painful emotionally already. I don't even function properly. I know it's pathetic but I just break down all the time, thinking it's the worst thing in the world, which I know it isn't. Nobody around me really understand either. My boyfriend, my family, they don't understand at all. At this point they just find me annoying the way I cry about it. Which I sort of understand but really just makes me feel even worse not having any support.